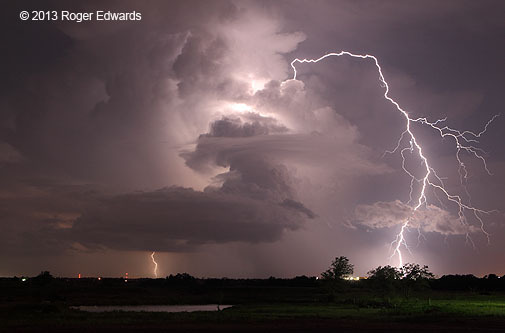 SHORT: Highly electrified twilight storms near home. 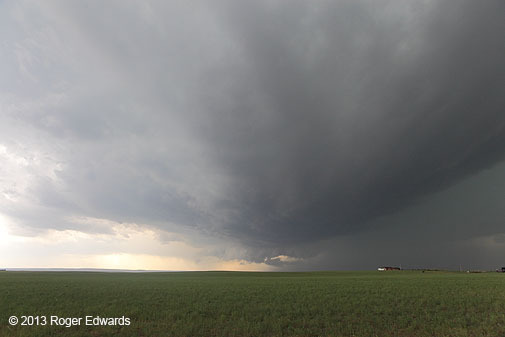 If one can define a “storm chase” as deliberately driving away from home in pursuit of the experience of storms, this was my shortest chase on record. 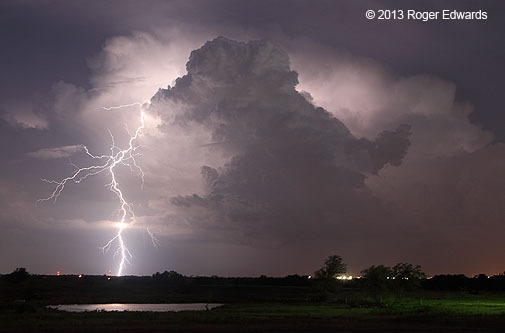 I have several vantages pre-selected in the Norman area for viewing and photographing the sky under various situations–day, night, lightning, arcus, rainbow, mammatus, sunset, sunrise, east, west, north, south–views not available from my largely forested property. However, none are as close as the one I used on this day–a previously unused, ad-hoc perspective less than a linear mile away. I typically don’t post these short “chases”, but this is a worthy exception. Seeing a large storm erupt on an outflow boundary to the SE, and flickers of lightning within, I didn’t know how long it would last, so a SE vantage several miles away wasn’t going to do. 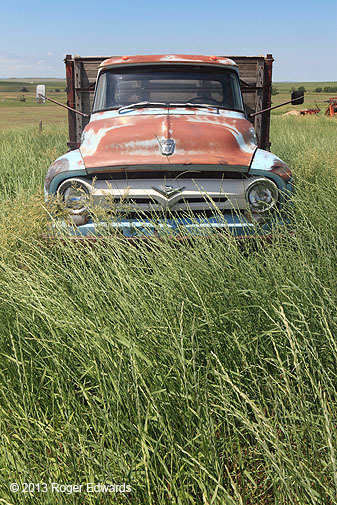 I exited my neighborhood and headed to a hilltop that–while not ideal due to a rather cluttered acreage in the foreground–offers the advantage of speed of access. 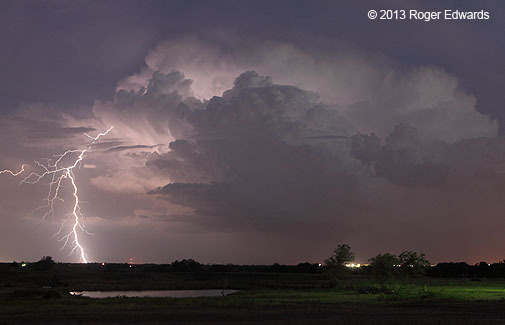 It also would help as new storms developed to the SW–convection that would have been much more distant and less photogenic from even farther E.
As that storm was weakening, I started packing my gear, when I noticed flashes in weaker convection to the SW and SSW (along the same boundary). 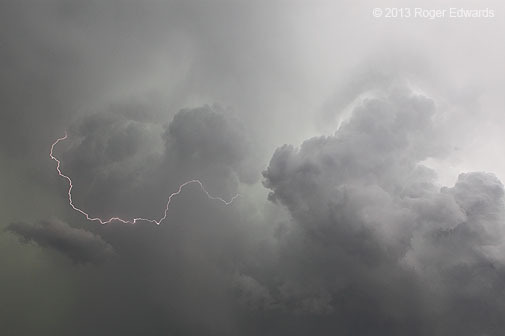 The updrafts looked skinnier and not as intense, yet suddenly…BAM! 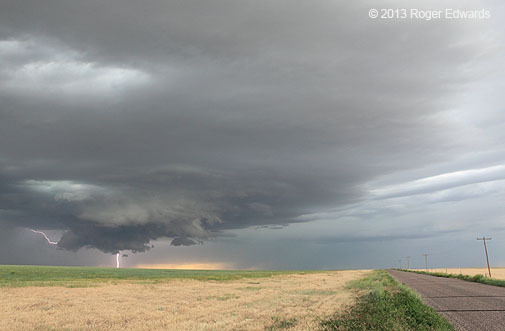 A discharge brilliantly flung well away from its originating cloud area. Time for action! I hurriedly twisted around the tripod and camera, realigning, re-aiming, hoping and wishing for more. 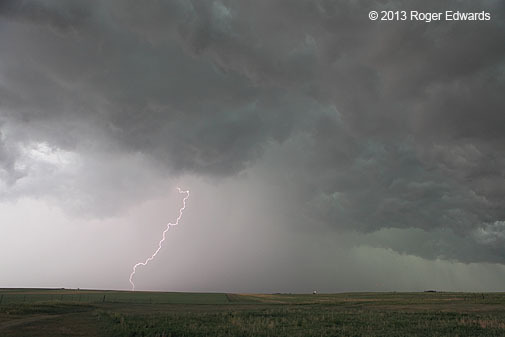 I started interval-shooting too, which caused me to miss a few of these spectacular “bolt-from-the-blue” discharges, but which also allowed for two more very brief time lapses. For once, I also managed to capture the most amazing stroke of the whole sequence. Consider my photographic desires fulfilled. 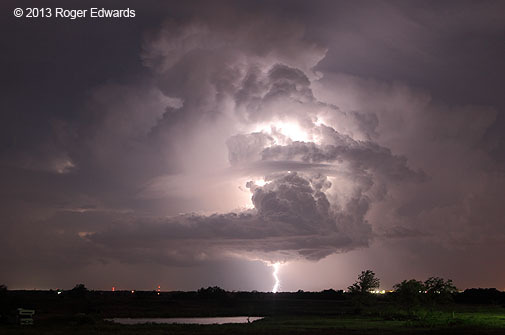 The cells kept blasting forked strokes far out through clear air, out of upper reaches of the convection, while also splendidly illuminating the cloud structures from within! 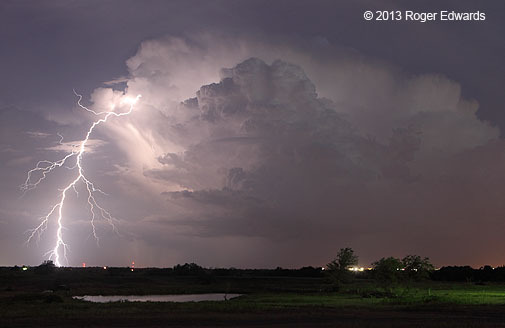 One of the most dazzling lightning strikes I’ve ever captured on film or digital media then burst forth from the opposite side, forking for many miles across clear air between cloud and some very unfortunate ground target. That left me exuberantly breathless, mouth agape, absolutely astounded that a “mere” summertime multicell could put on such a dazzling performance. Its thunder, though originating many miles away, reverberated through the air, felt within while echoing from laterally and behind. 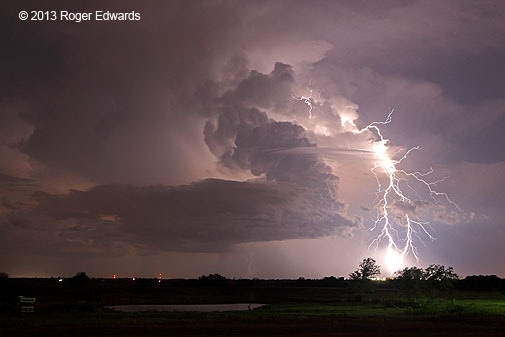 Finally, the storm had one more electrical javelin-throw in its arsenal before weakening. Those two short time lapses I promised? The first is here, and the second is here, containing each of the strokes pictured above, but in larger format whose animation you can adjust. The trip back home took all of two minutes. 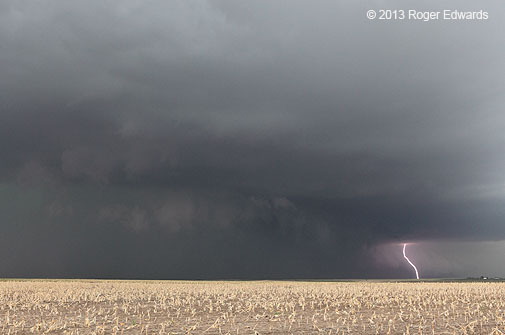 The “chase” yielded the only Image of the Week that I posted within less than an hour (the site goes by UTC time, hence the “12” date), and it’s not hard to understand why so little deliberation was needed. 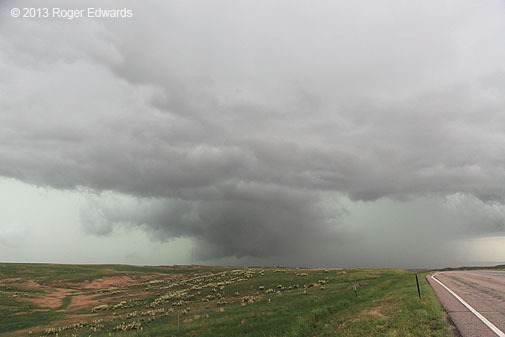 SHORT: Remained ahead of northeast CO convection as it metamorphosed from early, fuzzy slop near Hoyt and Wiggins to a supercell-infused squall line between Woodrow and Cope with several photogenic and beautiful scenes. 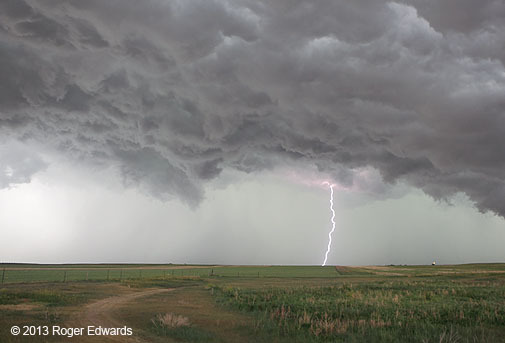 Final chase days of the season usually are known in advance to us, because we tend to take our Great Plains trips near the end of the traditional spring storm-observing season in a fixed time slot. 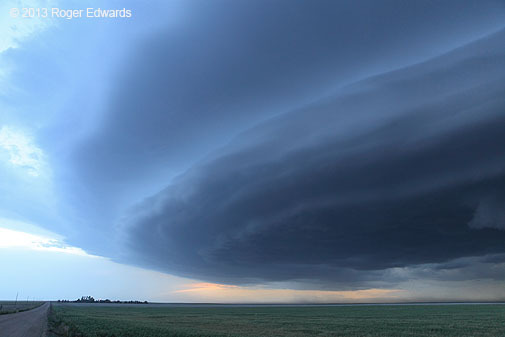 As such, many last-chance chase days are known as such that morning, if not before. They can get sentimental. We focus and reflect on the possibilities with a renewed sense of wonder and anticipation, knowing this is the final opportunity for the season and probably the year (save the opportunistic fall chase that happens once every five years or so). 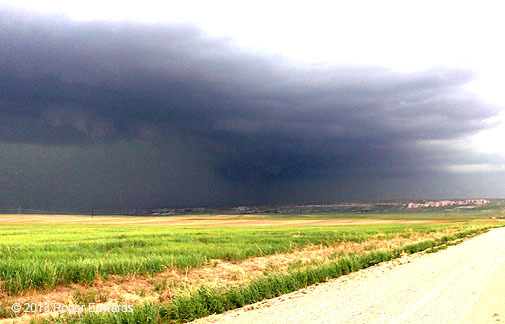 Northeastern Colorado was the target area, with the old outflow boundary from the previous day’s convection in WY and NEb having settled southward into eastern CO and weakened, leaving behind some upslope flow into the Front Range, reduced low-level moisture compared to the previous day in WY, and weaker (but still sufficient) shear for supercells. 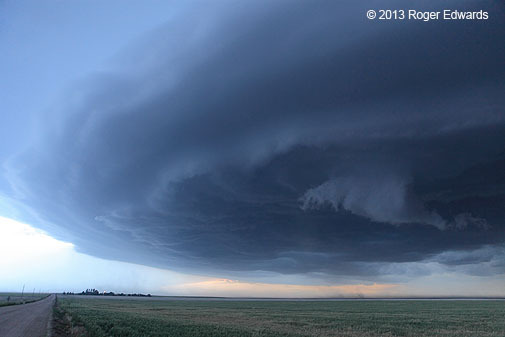 Cloud bases were likely to be high, with strong potential for outflow dominance and meager, conditional tornado risk. 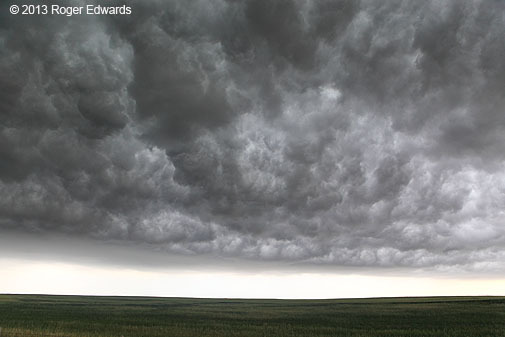 Yet these reduced-moisture, upslope-flow days often yield scenic skyscapes festooned with interesting storm clouds of various types–especially if one is patient with often ragged, nebulous early convection and keeps apace until it organizes. Forecast storm motion toward the CO/KS border area also likely would take us toward I-70 and a one-day drive home the following day. Our weather-dictated itinerary the previous several days had taken us from MT-ND-SD-WY-NEb, where we were starting the morning in Kimball, right by the CO border. 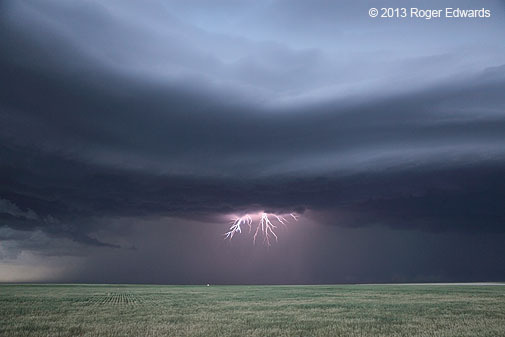 It was as if a storm-intercept guide had been navigating us gradually homeward with amazing skies and fantastic experiences all along the journey. How fortunate! And here we were, ready to partake of one more afternoon of beautiful storms on the way home. Proximity to the target area allowed plenty of time to eat brunch, analyze data, and watch the southwestern horizons. Early-afternoon towers erupting to our SW, in northern CO, were easy to see from IBM, so we cruised easily S to Ft. Morgan and saw the high, fuzzy bases even from there. 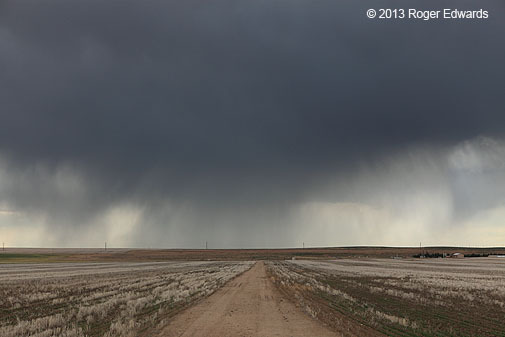 Continuing SW through Wiggins toward Hoyt, we got a nice close-up view of the virga factories, appreciating the majesty of the High Plains even under soft storms, on scales large and small. Small? Oh yes. We enjoyed watching birds that Elke couldn’t identify hop through the stubbled cornfields of 2012, skittering along at a deliberate clip, pecking away at bugs, seeds, or other material unseen. Next, we retraced the path back up to Ft. Morgan, then veered southward to get on proper road options that would allow us to stay ahead of whatever would evolve from the growing multicell complex to our W. While doing so, the convection slowly acquired visible, if still high, updraft bases, which gradually grew in areal extent and number along with CG flashes. I’ve seen this before. Usually, in these favorable deep-shear profiles, a supercell will develop unless the entire mass is blasted asunder in infancy by cold outflow. That wasn’t happening; the cores offered only feeble density currents, judging by the lack of proximal dust plumes. 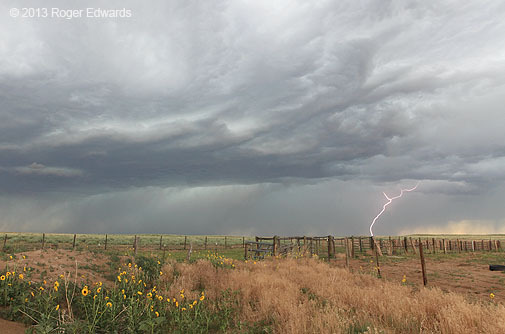 Jaunting off the main highway between Brush and Woodrow, a couple miles down a dead-end dirt road, we found a good place right at the terminus where we could photograph wild sunflowers and a wild storm. Cores grew. 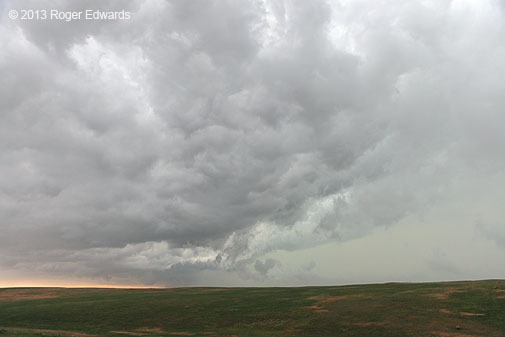 Updrafts grew in front of the cores. 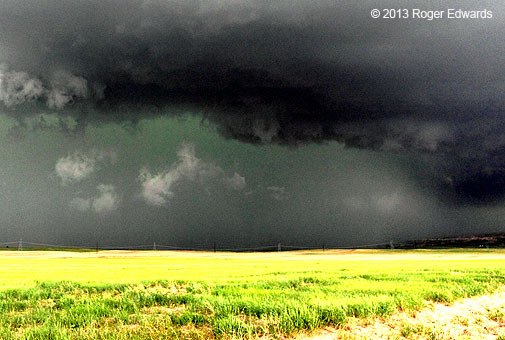 Inflow strengthened. The whole raggedly beautiful storm pile got better-organized and backbuilt before our very eyes, ears and nostrils, as revealed during a stop just S of Woodrow. 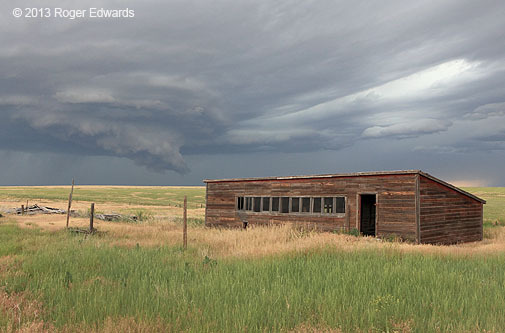 East on US-36 4 miles out of Last Chance, and another mile N on a (barely) paved side road, led us to temporary solitude: us, a photogenic abandoned farmstead and the rampart of storms in the west. Whoa! What’s that back there to the NW behind the old house? You guessed it, brother–not just an old storage building, but a high-based wall cloud and mesocyclone. 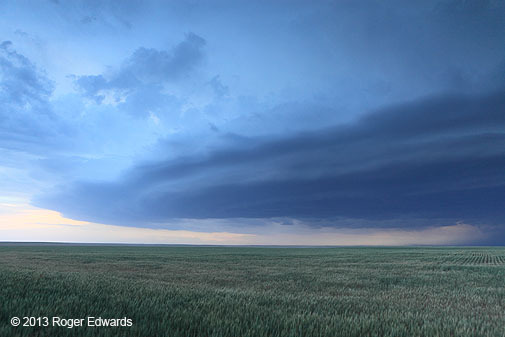 Although short-lived, the line-embedded supercell provided some striking, picturesque scenery as it headed ENE, before getting disorganized in favor of other updrafts to our own W and SW. While watching that spectacle, a ranch mom and her kids drove up on an ATV to make sure we were OK; we chatted with them awhile before one of the little ones drove them all back to their house on the four-wheeler. Encroaching storms sent us eastward to the Anton area. Even though the whole complex was becoming increasingly outflow-dominant in the fading daylight, a marvelous episode of deep twilight blues, slate to marine in hue, sandwiched layers of laminar cloud material to the SW…to the N…to the SW again. What a show! At least transiently intense, somewhat supercellular updrafts kept forming along its leading edge, with assorted notches (some rather sparkly!) and other circulations of varying scales. 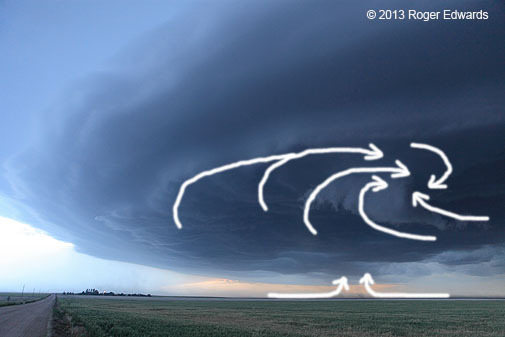 Admiring the scene, we also noticed that the base surfing outflow to our SW was becoming increasingly circular, quickly. 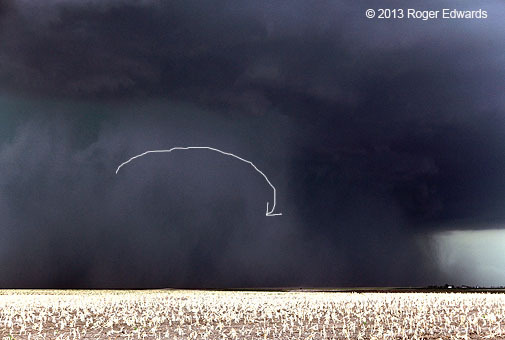 Within less than 30 seconds, and about a mile away (closer than it appears in this wide-angle shot), a small but tightly rotating wall cloud formed from a pre-existing, seemingly benign lowering under that base (annotated version). Quickly, dust stopped then rose beneath. 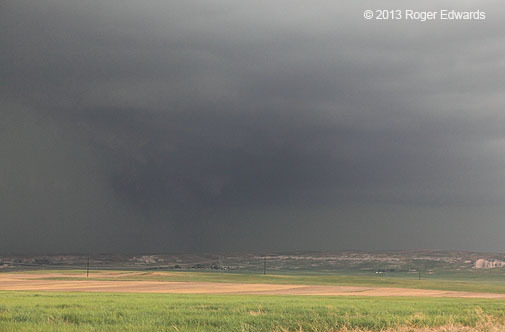 The circulation started to hook toward its NE–right at us. 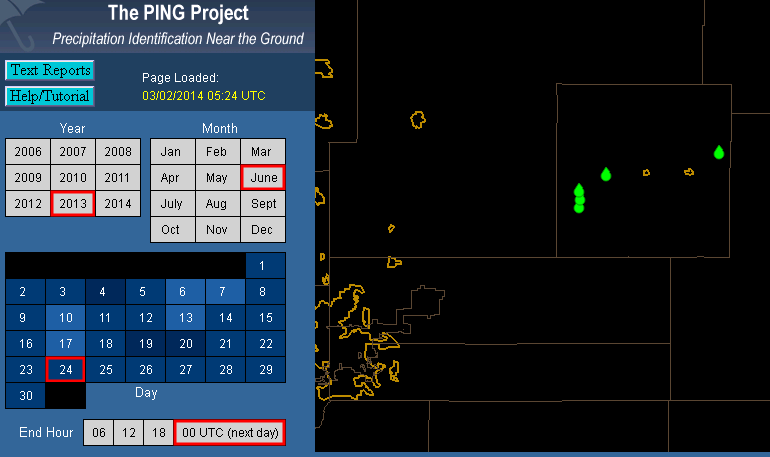 What had been light westerly (but mild) outflow winds backed and accelerated from the ESE. Time to bail out of there! Although I doubted any substantial tornado could develop in this circumstance, I didn’t want to be the guinea pig to test that hypothesis. 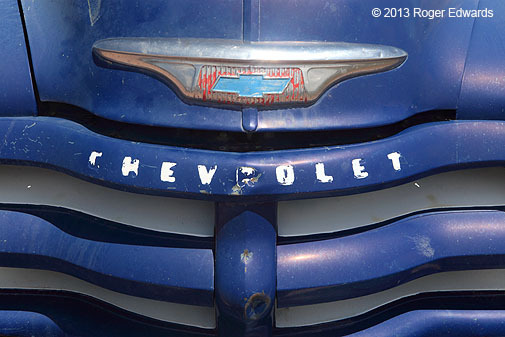 Even though we only had to go less than 1/4 mile to get back on US-36 and gun it eastward, we still were not comfortably relaxed–no thoughts of rocking in hammocks beneath Caribbean tiki huts while sipping dewy beverages. Instead, the rising pile of dust, under a small area of cloud-base rotation, with screaming inflow winds, nearly overtook us. I can’t say for certain if that circulation ever tightened into a full-fledged tornado, but if not, it came precariously close. Just as fast as it formed, deeper outflow from the west crashed through the feature and tore it up, leaving behind a dispersive dust pall over the highway behind us as we gained a few miles of headway. 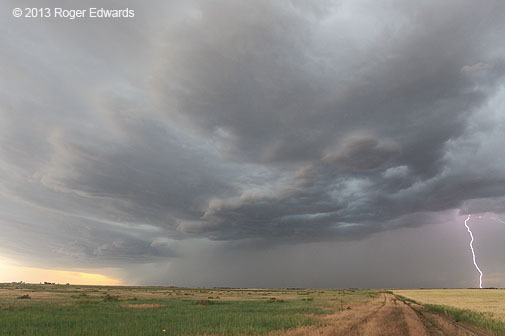 With daylight fading fast and eyelids growing heavier, we watched the mess become more linear and turned S toward I-70, out of the way of all storms. A night at our favorite motel in ITR, lightning flickering off to the N and NE, closed out our 2014 storm-intercept season with a lullaby after the atmosphere’s final flourish. Driving home the next day, we reflected and remembered. 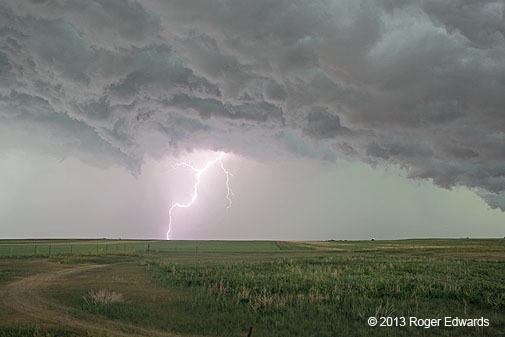 What a season it was…rewarding for us photographically, educationally and spiritually through the unfailingly transcendent experience of wonder and awe before storm-tossed Great Plains skies. 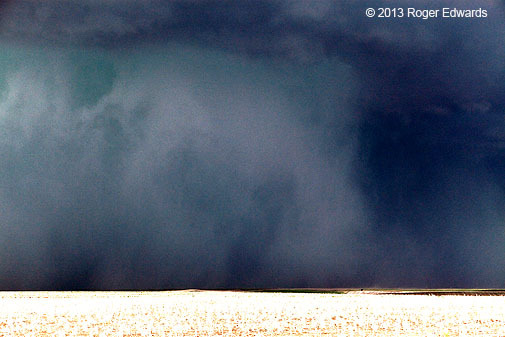 The sting of major missed tornado events practically in our backyard was healed during over half an hour of observing from one spot a nearly stationary, violent, yet ultimately harmless tornado in open country of northern Kansas. 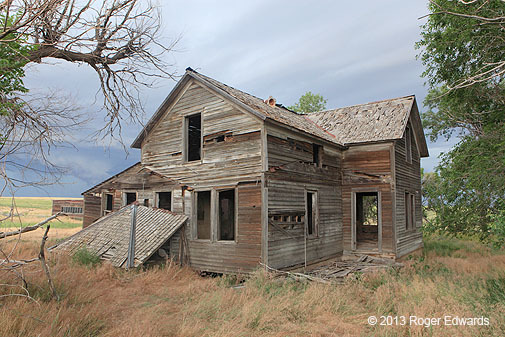 We made some great memories amidst the solitude of the prairies from North Texas to central Montana. With heavy hearts, we also thought of old friends killed just over three weeks prior by the vaporous forms we seek, on a day when we didn’t head out. Here’s to a safer and much less destructive, yet more photogenic and inspiring, 2014 storm season to come. 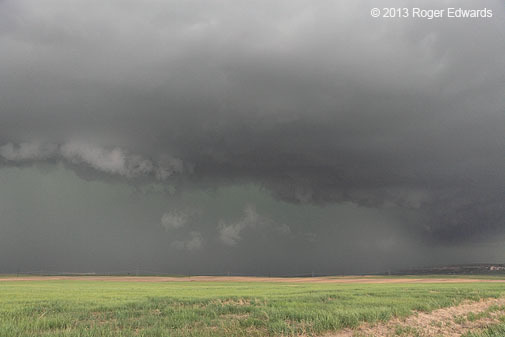 SHORT: Intercepted 2 supercells in SE WY, first photogenic, second became dark and nasty HP with about two tornadoes buried inside and barely/intermittently visible. 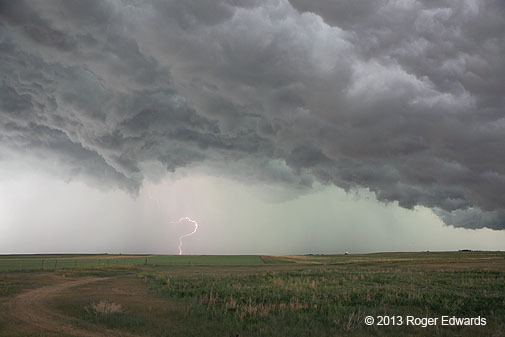 Lightning and photogenic outflow formations with tail end of resulting MCS in NEb Panhandle. Having made a full-circle back to Chadron from five days before, we did a little late-morning photography of abandoned antique vehicles that we had seen previously, then bid farewell to our favorite north-central High Plains town to head SW. We targeted as promising of an upslope-flow supercell scenario in southeastern WY as you’ll ever see, realistically. The previous day’s boundary was shunted southward toward the Cheyenne ridge, flow behind it veering throughout the day to both advect unusually rich low-level moisture upslope (beneath favorably strong midlevel winds) and yield a big hodograph. That moist air rising up the Laramies would do the heavy lifting, with help from hours of sunshine. Since we actually weren’t far away and were leaving before noon, I was as confident in seeing a tornadic storm on this day as any the entire June trip. Slap those hands together, fill the tank, hit the road, and get ready to rumble under some spinning sky. 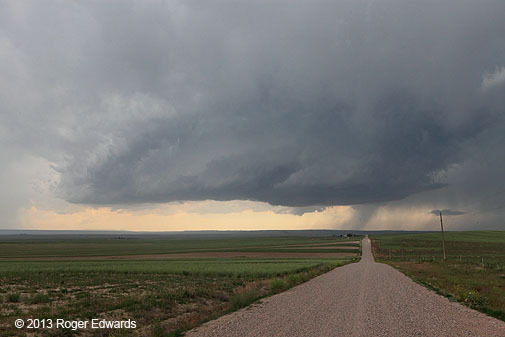 Supercells rolling off the Laramie Mountains under similar flow patterns and even less moisture have produced delicious tornadoes on several occasions in the last 15 years. For some reason, we (and I, before marrying Elke) had been late to the party for most of them, either missing the tubes or barely catching their end stages. 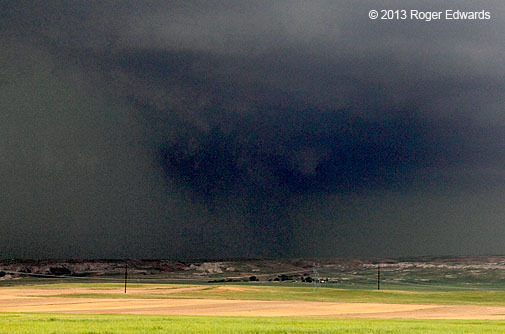 The 2010 Chugwater storm was, of course, a wonderful exception. Even early initiation wouldn’t be a problem, given the long N-S roads of eastern WY and the good visibility away from the E slopes of the escarpment between Hawk Springs and Chugwater. Over the hills and into Wyoming we went, fueling in Lusk under the midday sun as anvils began streaming off the northern limb of the Laramies. This was early initiation indeed…for which (for once) we were ready! 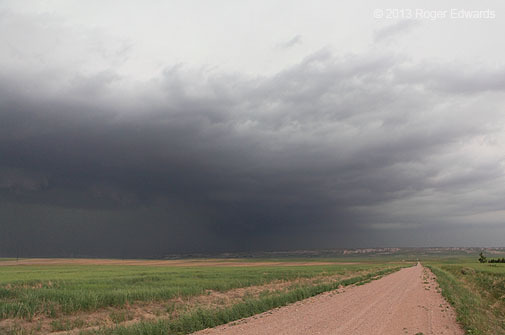 The most vigorous cell, near Dwyer, appeared to be turning right and organizing into a supercell fairly quickly. Fortunately, it was aiming right down US-26 toward the Lingle area, where getting ahead of it would be easy. 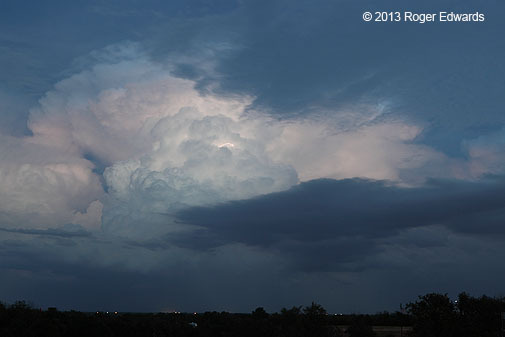 No wondering what was over the horizon, no driving 150 miles after an early-forming Wyoming storm already in progress! 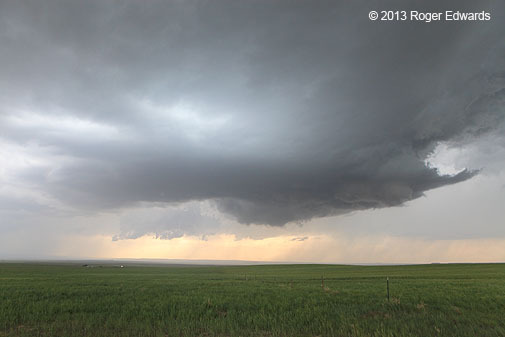 When we got just S of Lingle, there it was, in youthful supercellular splendor, to our W.
The supercell traveled ESE as another developed to its SW, with rain from the newer storm cascading into the established supercell‘s upshear region. 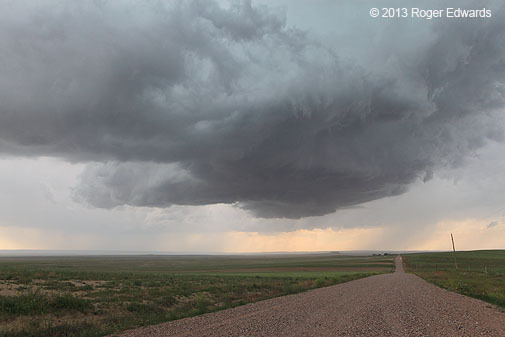 After briefly encountering fellow storm observers Vince Miller and Matt Crowther, we moved a few miles S, stopping briefly to watch a beautiful phase of the otherwise shrinking and rising cloud-base configuration, characterized by a clear slot with tightening rotation. Nothing came of that; the occlusion downdraft cut too tightly into the rotation area and dry entrainment eroded what was left. The older cell then slowly weakened at the expense of the rapidly strengthening upshear storm, and we headed S toward Veteran to get in front of the latter. What we found there was an entirely new animal–one that would turn into a menacing, growling, teeth-baring, attacking beast in short order. 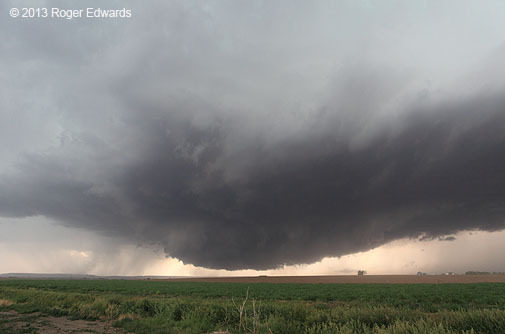 Looking SW at the reasonably large updraft area, ragged, slowly rotating shelf/wall cloud hybrid and dense core, it was easy to predict that this beautiful mess of a storm would become an HP in short order. Since the entire storm was moving ESE, this was an unsustainable viewing position; the forward-flank core and its hail would impose its will on us if we stayed put much longer. A quick zigzag E and S out of the Veteran/Yoder area took us onto US-85 NE of Hawk Springs and NNE of LaGrange. 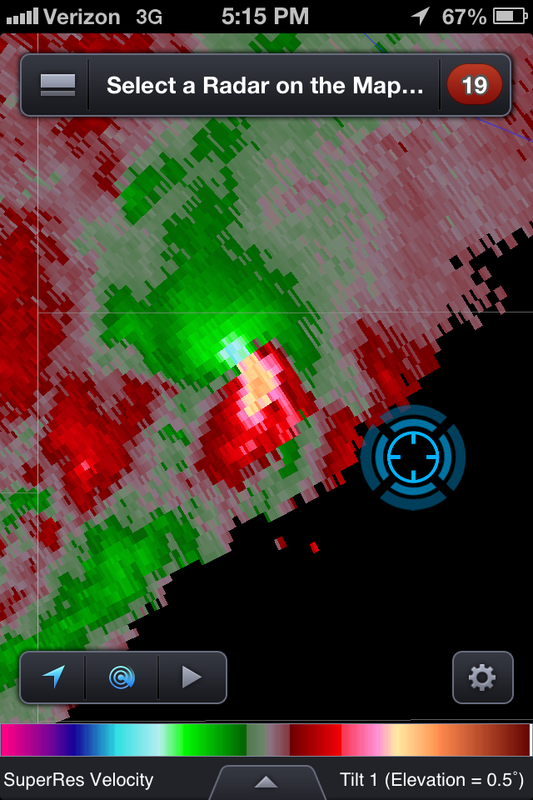 We had to bolt S ahead of the strengthening mesocyclone to our SW in order to take the east option toward WY-151/NEb-88. 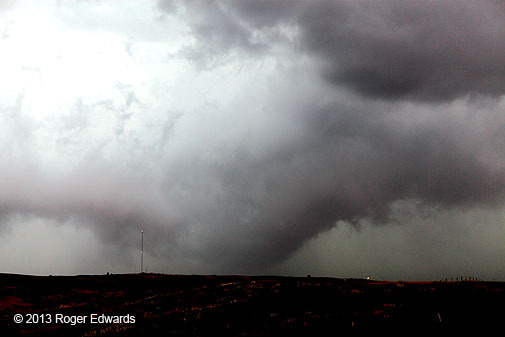 First, however, we had a few minutes to stop, observe and admire a very rapidly intensifying circulation–a photogenic and menacing wall cloud that quickly evolved into wide, rapidly rotating, nearly ground-scraping bowl, a mesocyclone that clearly meant serious business. 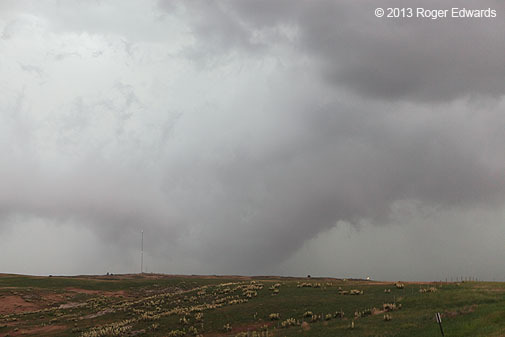 A small funnel briefly whizzed around the left (SE) side of the bowl, but with no clearly discernible debris beneath. The entire spinning mass of gas still was moving ESE and we were NE of it. No time to tarry…we had to go! We skirted the E edge of the orbiting precip curtains from N-S as the mesocyclone quickly wrapped in rain and the storm took on a mean, nasty HP form. 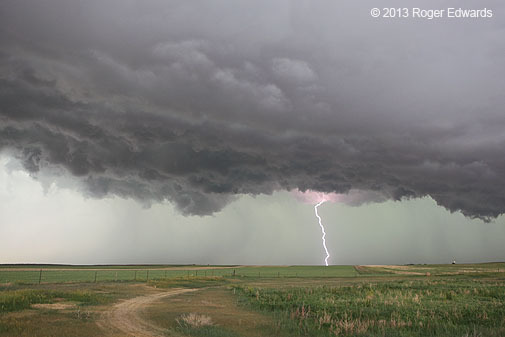 I’m used to tangling with those in north TX, but not on the more road-sparse plains of the WY-NEb border. Fortunately the east-151/88 option was conveniently located to offer a chance to get safely ahead of the whirling dervish for awhile, albeit in the eventual path. A brief glance at radar indicated a rapidly tightening and potentially tornadic mesocyclone to our NW as we approached the border. 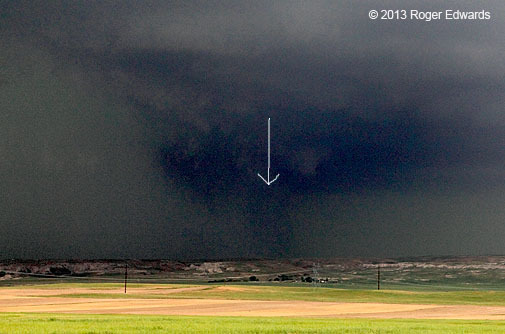 I stopped there to observe and thought I might have seen the tornado (see photos in table below), one about which I was more certain that night, after viewing the photos via camera display and talking with the NWS office. Given its S of E movement, we couldn’t stay too long. After charging E across the border, after a mesocyclonic cycle, and while I still was driving to gain some distance, Elke took a look at the radar display and saw this rather alarming SRM signature a few miles to our NW. 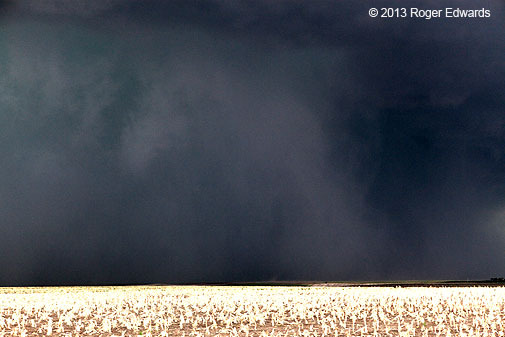 There was obviously another tornado somewhere in that dark precip mass–and likely a significant, potentially violent vortex to boot! It also was moving ESE, meaning we would have to stair-step along the W-E highway in multiple stops to stay safely ahead of it, and of the wrapping precip. 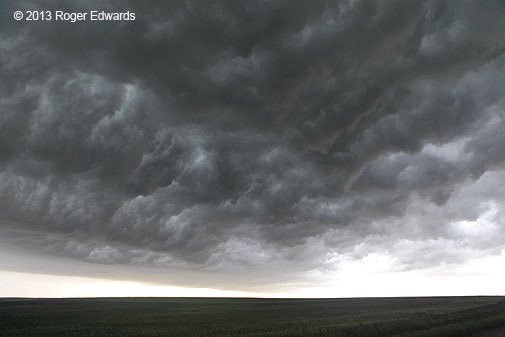 Needless to say, I slowed down really quickly and turned into a northward-directed side road to stare hard into the rotating cylinder of precip. 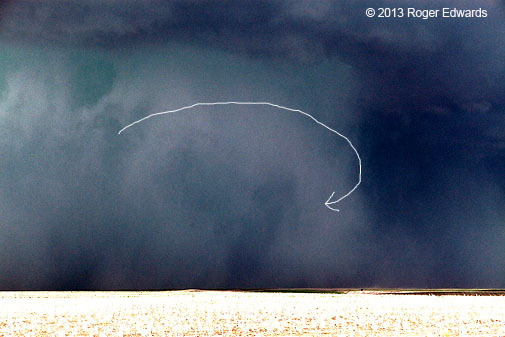 At times, during the second of two different stops along NEb-88, I could make out the tornado ‘s condensation funnel–briefly, barely but confidently. We stopped again after turning S on NE-71 past Harrisburg. Because the tornado on the Wyoming side of the border (images 1-3) appeared to shrink and get deeply occluded into the precip, and because NWS CYS surveyed a distinct tornado track on the Nebraska side, I now very strongly believe (>95% certainty) that the Wyoming and Nebraska tornadoes were separate. 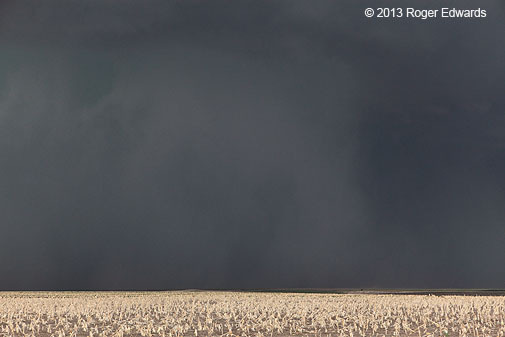 On the Nebraska side–yes, there also was another dark, columnar area to the left (SW or WSW) of the tornado cyclone in a few images (mainly 4-5), but I could not tell what it was. 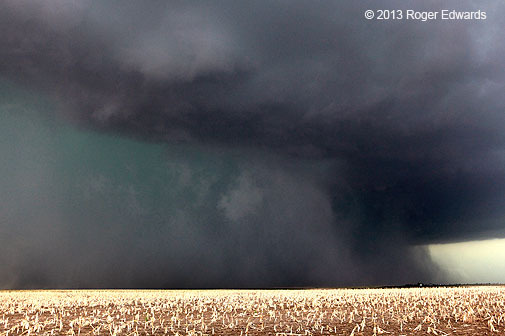 The rotation of precip around the tornado in each photo was furious and obvious. Even when I couldn’t see the tornado at all (which was most of the time), there was no doubt of its presence. 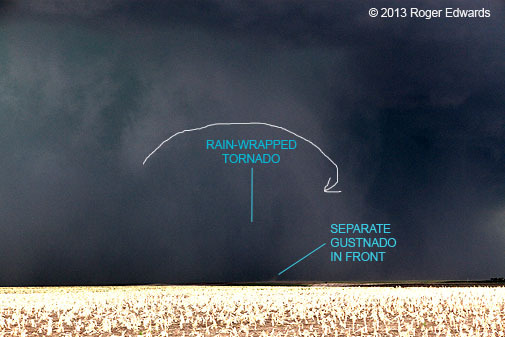 Due to lack of visual continuity, I also can not state definitively if the Nebraska tornado was continuous between stops, or two separate events. NWS surveys indicated one path in Nebraska, so I’ll count this as a single, second tornado for now, given no firm evidence to the contrary. The tornado only hit a few things, earning an EF1 rating due to sparse/weak damage indicators. However, its WSR-88D radar signature is consistent with many strong to violent (EF3-4) events, based on a study underway by Bryan Smith and others at SPC. We’ll never know its true strength. The tornado moved almost directly toward my position in image 9, but dissipated before it got to NE-71. By that time, we had bailed S, out of the way, and found a hilltop S of the 71/88 intersection. There, we tried to view the deeply occluded, embedded meso as it got thrust back out of the rear side of the precip area (enhanced. 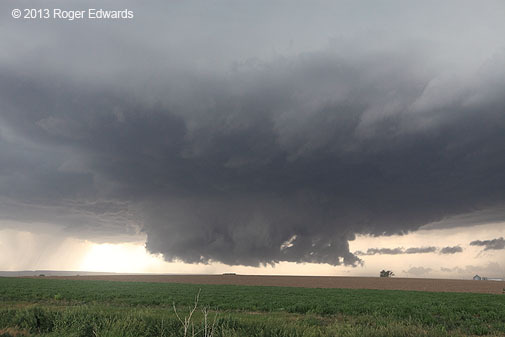 There may have been a weak tornadic (or nearly tornadic) circulation still going at that point (enhanced), as visible cloud-base rotation still was reasonably strong. I can’t say with complete certainty. 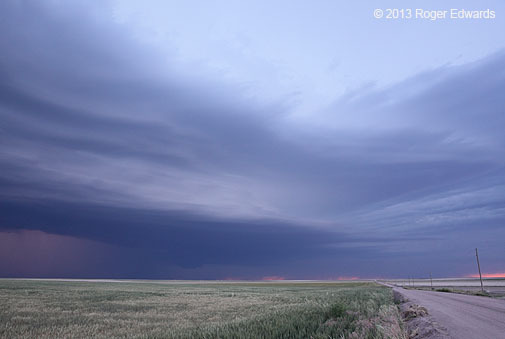 By this time, a big gust front and shelf cloud had surged well ahead of the mesocyclone. 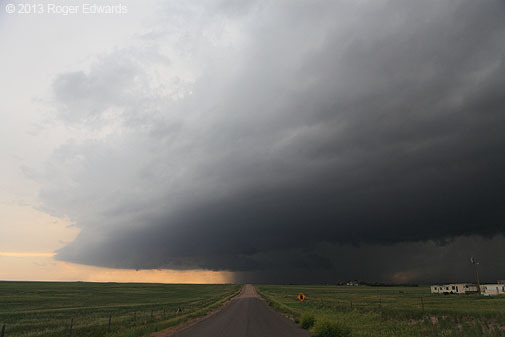 The supercell was evolving into a linear structure with more storms erupting to the SW–we had an MCS and QLCS on our hands. Plenty of daylight remained, so…time to go tail-chasing! We proceeded S to and past Kimball in search of a vantage, and found one 3 SSW of town on County road 28, right along the N side of Kimball airport (IBM). This was a treat! 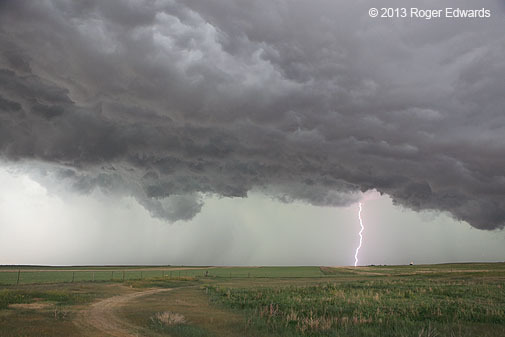 Even though the complex was decidedly outflow-dominant at this stage, its arcus underside and photogenic lightning were just plain fun to observe. The core passing to our N fired a good volume of electrical artillery from the same general area (including one whose most visible segment was “questionable”). 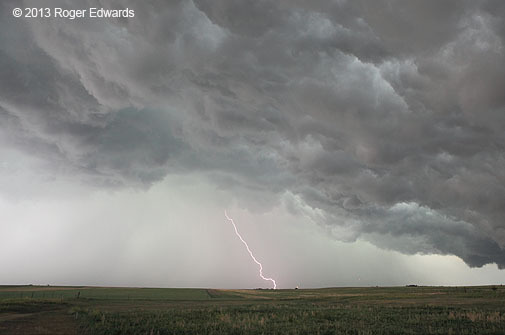 One bright outlier, an outflow-influenced channel and a few other strikes followed as the core moved E. Meanwhile, the arcus’ underbelly passed overhead and to the S with fantastic sharpness to its turbulent texturing. What a crazy, interesting sky! Ravenously hungry by now, and chilling uncomfortably from all the outflow, we snapped the shutters at a few more strikes from the last passing core, then headed into town for dinner. 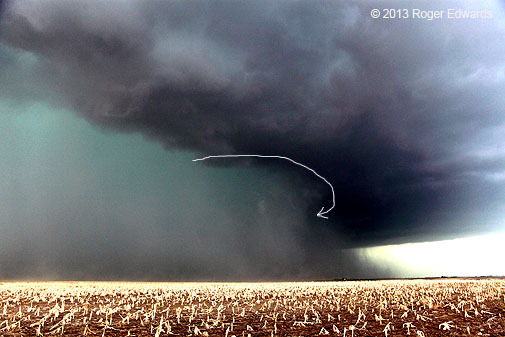 Amidst that huge and expansive puddle of outflow, we didn’t imagine that an updraft would blossom to the E that was surface-based, and produce a brief tornado (seen by a few observers still afield) before being undercut. That’s how it goes sometimes. While somewhat disappointed, we could live with it. 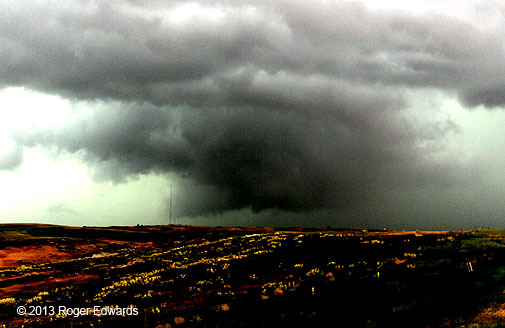 We had seen some serious tornadic action already, and the hot pizza tasted mighty good going down. Here was one final look at the back side of the complex from the pizza-parlor’s parking lot, as the storms retreated into the suppertime sky. 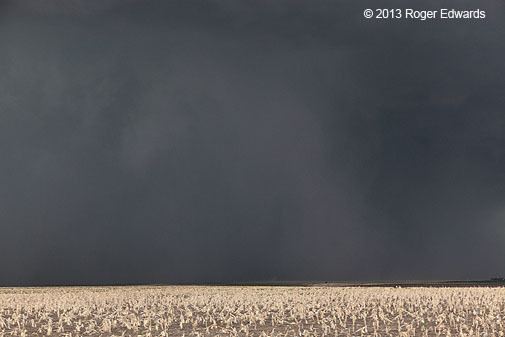 After checking into the motel in Kimball, I got the tornado time/track info to the CYS WFO to the best extent possible, then reflected back upon another long but very rewarding chase day–one fruitful both photographically and in terms of both tornadic and nontornadic storm experiences. 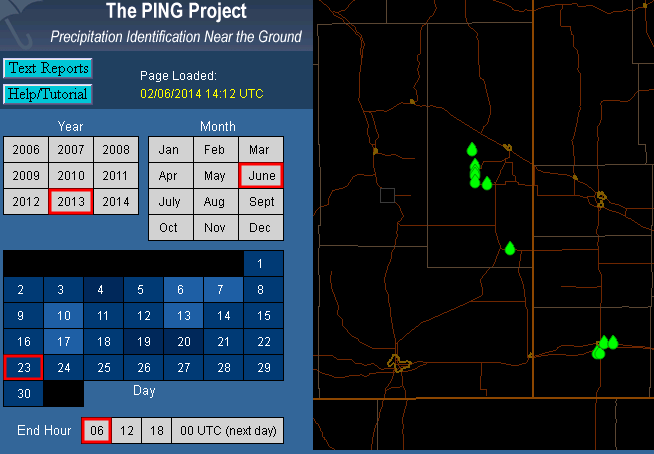 Forecast guidance also indicated that we had one more day of decent storm potential in CO before we had to head home. Our time in Montana was growing ever farther away in the rear-view.